Look, we’ve got to get a better relationship with how we eat meat. Not only are the cruel conditions and overcrowding at factory farms considered to be one of the leading causes of climate change but just like– look at this little pig paint!? You’re going to tell me you’d eat Picasso the Painting Pig? Because I would not! For one all the paint and brush hairs he’s ingested would probably make me very sick. Also, Picasso!? This guy is much more of a Jackson Pollock, although recognizing that many color patterns is pretty good for an animal. 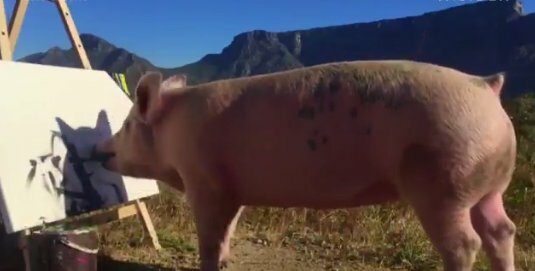 Picasso the pig is a farm animal who was saved from the slaughterhouse due to his incredible skills with the brush. His painting got him saved from the slaughterhouse, but I ask you, couldn’t we just not eat him? I mean, if having a human talent the only thing that can save a farm animal! Because that’s a hell of a high standard to hold an animal too! What if a leopard was about to eat us and we go “no no! I too can pee in the woods to claim my territory”, and they go “whoa, you’re smarter than I thought…” Not a good situation for anyone, right? Speaking of think, what do you think of Picasso the painting pig? Let us know in the comments or on Twitter at @WhatsTrending.